I have my elephant ears in a container. I want to know if I can plant garlic with them. The container is large. Yes, it should be possible to plant both in the same container. 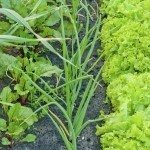 Just make sure the elephant ear leaves won't shade the garlic too much- if they are too crowded, you may have to remove a few leaves to allow the garlic to get light.